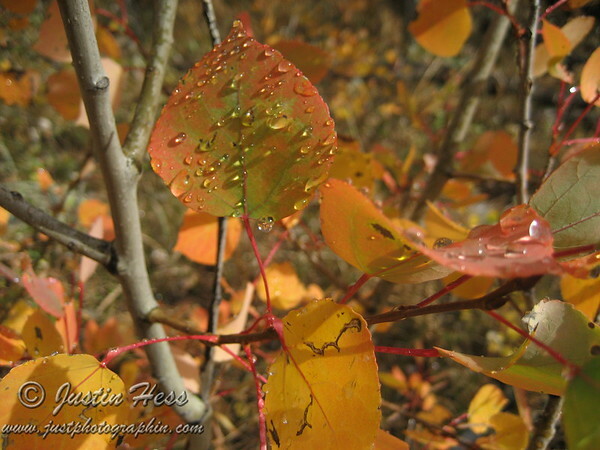 Water Droplets on Aspen Leaves. This photo was featured by the National Park Foundation! I took this photo along the trail on the way back from Finch Lake in the Wild Basin area of Rocky Mountain National Park. It was a fickle weather day and the group that I was with actually got caught in a freak thunder snow event! Luckily, the weather cleared just as quickly as it came in and left the aspen leaves with water droplets as the sun re-appeared and I was able to capture this photo. One of the hiking members described the fall color as being “apricot” that year and location.